Ząbkowice Śląskie [zɔmpkɔˈvit͡sɛ ˈɕlɔ̃skʲɛ] (German: Frankenstein in Schlesien) is a town in Lower Silesian Voivodeship in south-western Poland. It is the seat of Ząbkowice Śląskie County, and of the smaller administrative district (gmina) called Gmina Ząbkowice Śląskie. The town lies approximately 63 kilometres (39 miles) south of the regional capital Wrocław. As of 2011[update], it had a population of 16,086. The town was established by Duke of Silesia Henry IV Probus as Frankenstein in the early 13th century, following the Mongol invasion. It was sited on a piece of land that belonged partly to the episcopal lands of Procan (German Protzan, modern Zwrócona) and partly to the Monastery at Trzebnica (German Trebnitz). The town was located exactly halfway between the sites of two previously existing towns that had failed to attract enough settlers: Frankenberg and Löwenstein, and inherited its German name from both. Its positioning on the so-called Königstraße (King's Road) between Prague and Breslau, not too far from the commercially important city of Glatz would favour the development of the town. The town received municipal rights around 1280, the first mention of civitas Frankenstein is dated 10 January 1287. As from 1335 it belonged to Bohemia, and from 1742 to Prussia. In the early 17th century the plague killed about one third of the population, and it has been speculated that events at that time may have inspired the Frankenstein story. In 1858 the town burned down and had to be rebuilt. On this occasion, the upper part of the 15th-century leaning tower was reconstructed in a straight manner. The town was a county seat from 1816 to 1945. 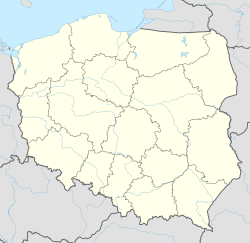 After World War II the town passed to Poland, along with most of Silesia, and was renamed as Ząbkowice Śląskie in 1946 to replace the original German name of the town. The town's native German population that had not fled at the end of the war fled was expelled, with new Polish citizens taking their place. Ząbkowice Śląskie is often called the Silesian Pisa as it is known for its Leaning Tower (Krzywa Wieża), which is one of the main attractions in this part of Poland. However, you will also among tourist attractions find 13th century fortifications and the ruins of a 14th-century castle. "Frankenstein" . Encyclopædia Britannica (11th ed.). 1911. "Frankenstein" . The American Cyclopædia. 1879. Wikimedia Commons has media related to Ząbkowice Śląskie.